While I know that we are in 2016 and SharePoint 2013 has been out for 3+ years, I still want to include this even though it was pretty much removed in SP 2013 (at least as Service). What is left of Web Analytics has moved to be part of the SharePoint Search Service in SP 2013 and (I am assuming) SP 2016 as well. It was removed because it didn’t scale well in large enterprise environments. More information on this can be found in the feature change list of SP2010 to SP2013. SharePoint web usage analytics will meet the needs of most businesses. 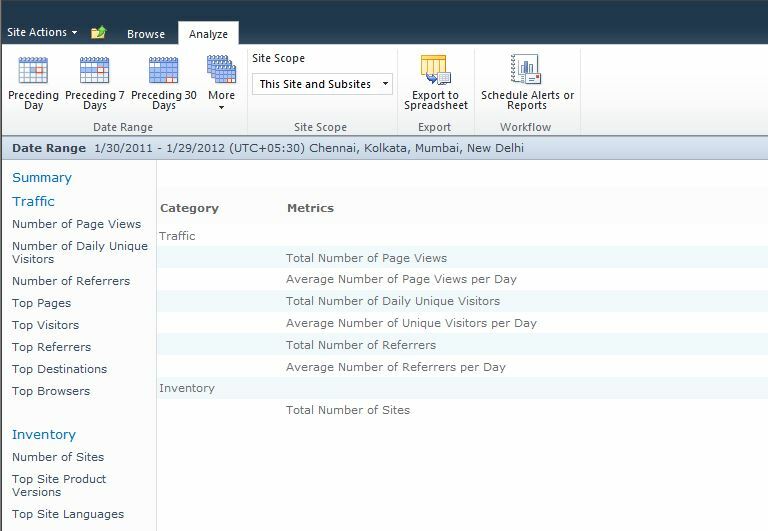 It provides OOTB reporting on site traffic, search usage and even system inventory (number of sites, space used, etc). You are able to view reports at different levels within your environment. These levels include per web application, per site collection, per sub site and for search you can view per search service in your farm. Access Central Admin of your farm and select Manage Service Applications under Application Management. Update the DB Server as needed and set the staging and reporting DBs to fit your farm’s naming scheme. Click Ok to provision the service. Select System Settings from the Quick Link section on the left. Find Web Analytics Data Processing Service and Web Analytics Web Service. Enable both of them. Ok, now you are done. Traffic based reports – Reports on Page views in your site, referrals to your site, top users of your site and things like top daily user, frequent browsers and such. 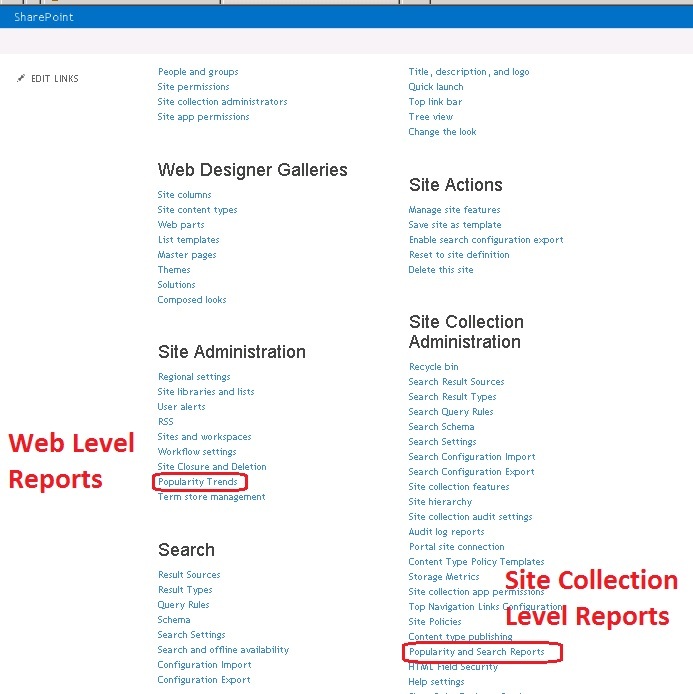 Inventory based reports – Reports on site architecture (no. of sites, space used, etc). 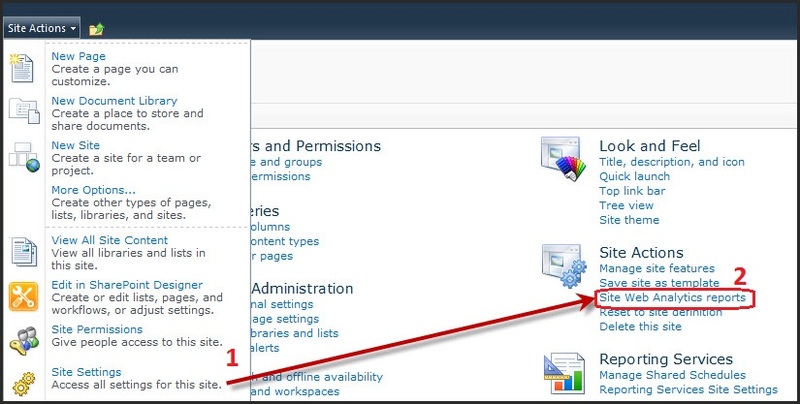 To access the reports click on Site Actions – Site Settings. 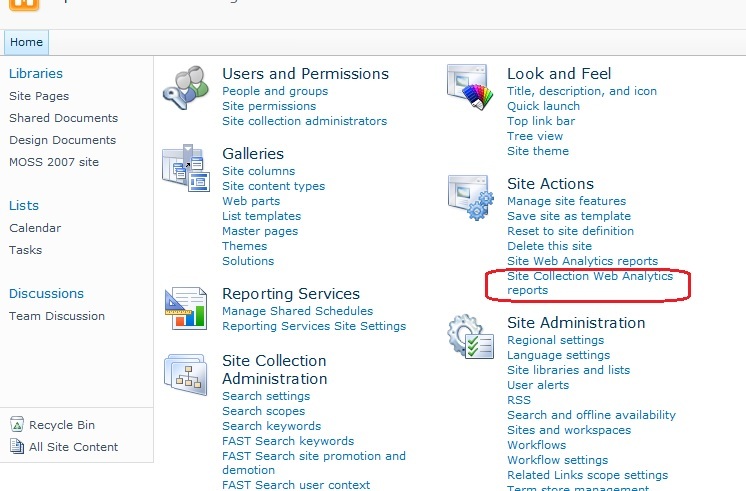 Next click on Site Web Analytics reports under the Site Actions section. From there you can select the type of report that you wish to view. And how far back you want to go (just remember to be on the Analyze tab). You can create custom reports but today I am just showing you what is OOTB. 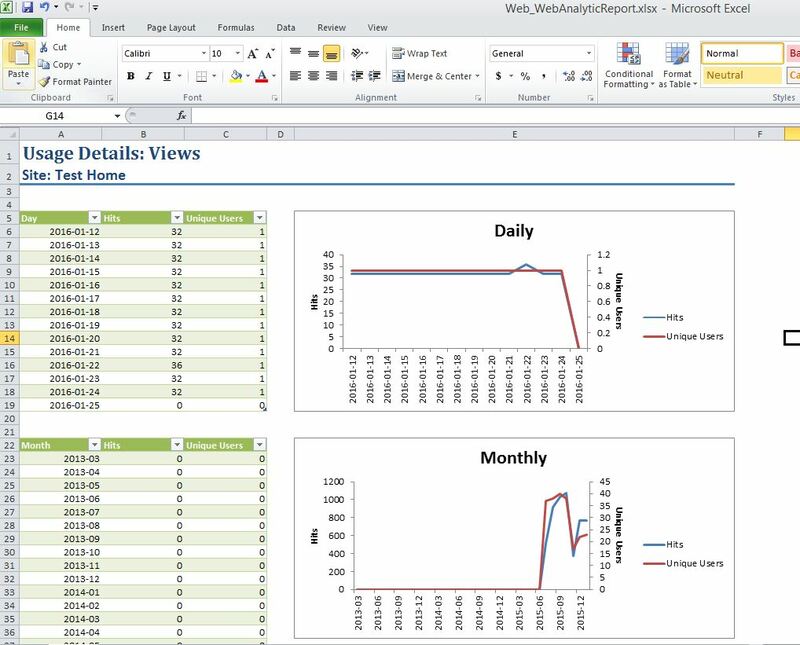 Like other Sharepoint Audit Reports, the usage report is simply an export that SharePoint generates for you into an Excel report. It is very basic, compared to what you got in SP2010. In fact you only get number of site hits and unique users. Broken up by Day and Month. It does give you some graphs to go along with it, but then again, so does SP2010. 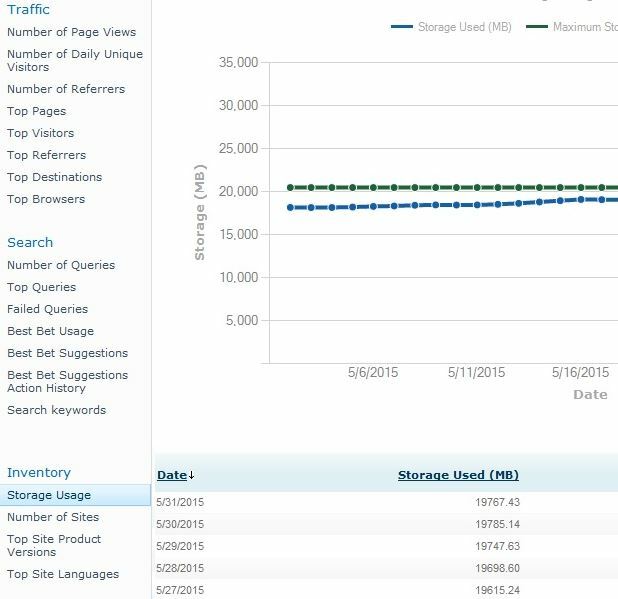 Usage – Exactly the same as the sub-site level report, except reports on all access to the site collection. Number of Queries – Provides the number of times search was utilized. Creates a tab for each search scope within the site collection and a summary of all (so you will have two tabs if only one scope enabled). Abandoned Queries (Day and Month) – Reports on queries that didn’t result in solution clicks. No Result Queries (Day and Month) – Often used queries that didn’t return any results. Query Rule Usage (Day and Month) – Shows how often your specific query rules (if you have any created) are used within searches. 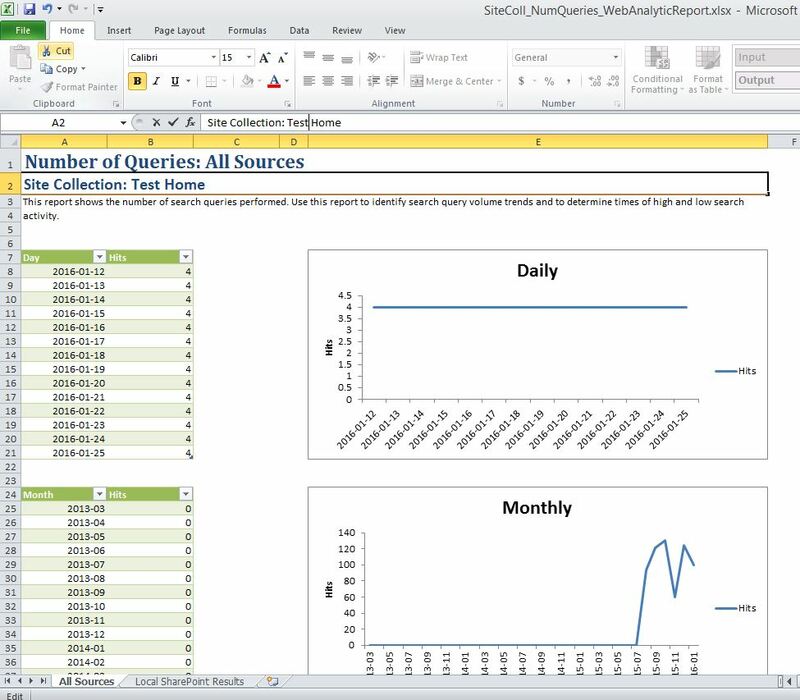 All reports generate Excel spreadsheets and do not contain raw data like other audit reports. You will now be presented with a search results screen that will display recent file access as well as the number of times the document has ever been accessed. Also, because you are in search you can look at the most popular items by file-type, by author and over specific times OOTB. I would show you a screen shot, but my demo environment doesn’t have any analytics to report and I can’t use my clients’ results for obvious reasons. So that’s it for Web Analytics in SharePoint. I hope this helps answer any questions you have concerning SharePoint Web Analytic reports and what is available to you OOTB. Thank you for letting me know Cynthia. I recently moved to a new host and I guess some of these links were broken. I will have to go through them and update. Thanks for bringing it to my attention.